I fly into barcelona– take a 3 1/2 hour bus ride to Andoora– a tiny country you probably never heard of (unless you went to camp evergreen- then cue to burst into song). i arrive totally bleary eyed- and justin takes me to this tapas place- orders a bunch of things in spanish- and i have no idea what’s going on. but out arrives these amazing little green peppers- fire roasted and covered w. this epic sea salt. A few days later in Barcelona, i went to this restaurant–Paco Merlago thanks to Judy’s friend– and became obsessed with it for the 4 days I was in town. Mark my words- if anyone wants to join me next December– birthday dinner, 30yr old- will be there. i ate some blow-your-tastebuds dishes and still thinking about it a month later- decided to try to recreate some of them. I didn’t exactly have the recipes to guide me so I invited Reed and Rach over for dinner and got to experimenting. Surprisingly, it was a really easy and quick meal to throw together. By the way- if anyone is on their way to Barcelona I have a little googlemap of places I tried. If anyone has these for other cities too– would love to see! When you get tapas in Barcelona- you most often get an accompaniment tomato bread- Pan con Tomate- to lap up all your tapas with. It is generally on a bread- a bit wider and a bit less crusty than a baguette. To make, toast bread (i used ciabatta pannini loaf.) Drizzle olive oil on bread and toast in oven or face down in pan. Take a clove of fresh garlic in hand, rub on toasty bread. Cut the top off a fresh tomato and rub that on bread. Sprinkle w. sea salt. I ordered this sausage and egg dish at Paco and it arrives at the table bubbling hot sausage in a little clay pot– then they crack an egg in it table-side and mix up for egg to cook. The sausage in this dish was more of an italian style- but I thought i’d make what we think of as chorizo flavored. I was surprised that i didn’t come across chorizo as we think of it in spain– there, it is just the word for pork sausage- and I believe generally refers to a cured, hard more salami like. Also, in my research- I learned that mexican chorizo has a wholely different ingredient list. This is adapted from Emeril recipe. Original calls for 3 pounds pork, cut into 1-in cubes and 1/2 pound pork fat, cubed and involves a meat grinder and cases. But as I didn’t have such- I decided just to make it uncased and start w. 1 pound of ground pork– and the adjusting the spices accordingly. I didn’t have a little ovenproof clay dish for serving- so used a frying pan. Put all spices in bottom of a bowl. Take a fork and mix in pork and wine. Let sit for a day or two for flavors to meld. I ate at 12 hours and again 36. Probably a difference- but still super delicious at 12- so don’t sweat it either way. I’m sure if you had to use some immediately would be good too. I just cooked a portion– then left the rest raw to continue to blend- instead of having cooked leftovers. To serve- cook chorizo on stovetop in oven proof pan. Throw in very hot over for a few minutes (450 or 500 should be fine). Using an oven mitt! bring to table to show your friends. Crack a raw egg or two in- depending on how much you are serving- I used 2 eggs for half the meat. Mix up immediately and egg will cook. Eat w. tomato bread. There is actually a recipe for this in an Alice Waters cookbook. And it calls those small green peppers I had in Andorra Padron pimentos- also says Nardello or Lipstick peppers would work. I bought what I could find- which worked very well- labeled red and yellow sweet peppers. I used this amazing salt i bought in barcelona- at this awesome store- called Gispert. To make. Heat a cast iron or stainless steel skillet with a thin layer of olive oil- medium-high heat. Lay peppers on. They will scorch and sizzle. Using tons, flip over periodically. Cook until start to blacken and blister- 5-10 minutes. Put on serving dish sprinkle w. the biggest coarse salt you have. Maldon sea salt flakes would work. Or fleur de sel. This was an experiment. I more or less used the chorizo spice list. It was not quite the same flavor I had in Barcelona. But still super tasty. Serve w. tomato bread. The technique for making it was loosely inspired by a warm seafood salad recipe in the Union Sq Cafe cookbook. In a skillet, heat olive oil on medium. Add garlic, spices and tomato paste and let cook to release flavor- about a minute (do not let garlic burn.) 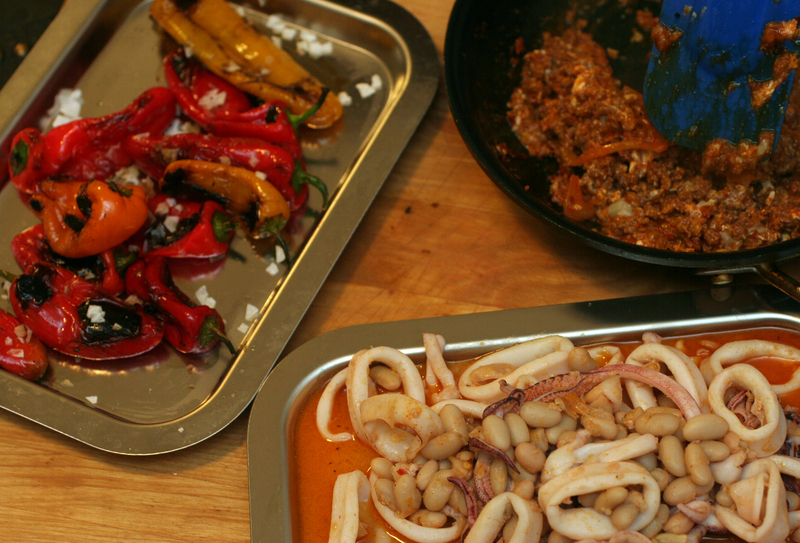 Turn up heat to high and add calamari. Cook for 2 minutes- mixing around. Lower heat back to medium. add beans, white wine, cook a little further for wine to cook off and beans to heat. Take off heat. Finish w. salt, pepper and the juice of one lemon and parsley. Makes 12. Place the popover pan in the oven. Heat oven and pan to 350 deg. Gently warm the milk over low heat and set aside. Whisk the eggs until frothy and slowly whisk in the milk (so as not to cook the eggs). Set the mixture aside. Sift the flour with the salt. Slowly add the dry mixture to the eggs and combine until mostly smooth. Once combined remove the popover pan from the oven and spray with non stick vegetable spray. 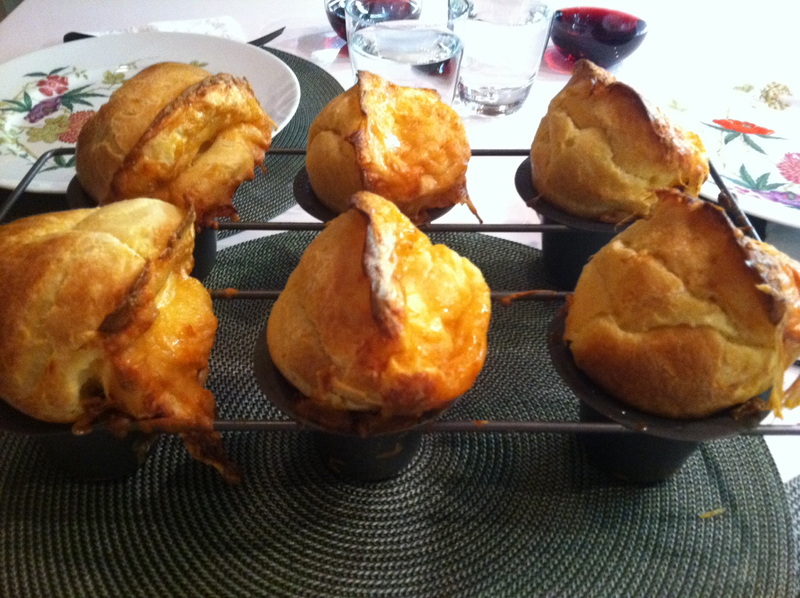 Fill each popover cup 3/4 full and top each with 2 1/2 tablespoons of gruyere cheese. bake at 350 deg for 50 minutes, rotating pan half a turn after 15 minutes. Serve immediately. I am so thrilled to have my first guest blogger— Mara Sprafkin!! This gorgeous recipe- and charts– I am beyond impressed. Though of course, nothing less would come from this talented artist— check out her site Mara Sprafkin— and her assistant Paul’s blog. I was very excited to guest blog this recipe for Tessa. I tend to use her recipes quite frequently as I have been cooking more and more. I set out to learn to bake bread in September and started with Challah. 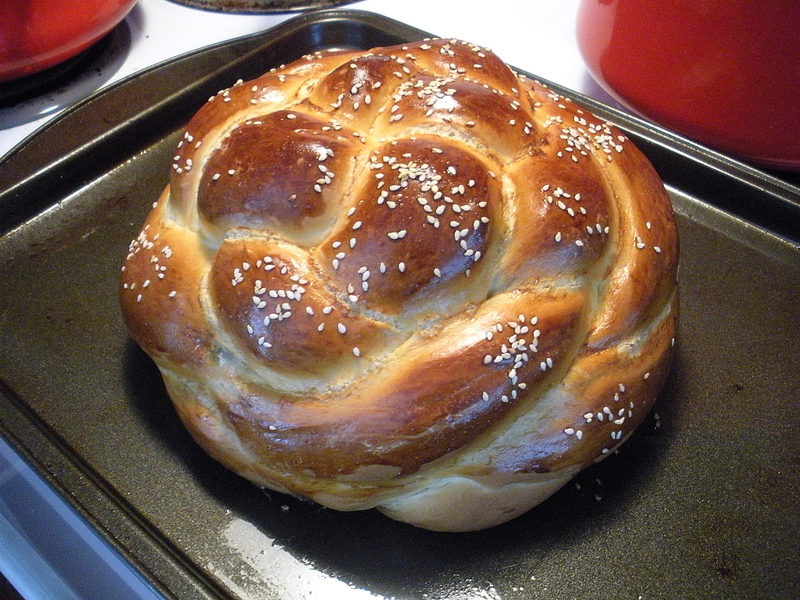 This may seem complicated but Challah is a relatively easy bread to make by hand. You don’t need bread pans and you probably have all the ingredients already in your house. It is a perfect thing to try if you are stuck in the house for a while. And in the end you get freshly baked bread. And that is it’s own reward.This Challah recipe comes from my mother. It is dated January 15th, 1966 and came from the Temple her family attended when she was a kid growing up in Southern California. I have adapted slightly for the High Holidays by substituting honey for the sugar, adding raisins and doing a fancy crown braid. 1 packet of yeast (if you have jar and not the packets you can use about a tsp and a half. Put the yeast in a large bowl. Add the cup of VERY WARM water, the whole egg, honey, salt and oil and the 3 1/2 cups of flour. Mix well with spoon and by hand. Once the dough seems well mixed sprinkle your work surface with flour and knead dough. You probably only have to do this for about 10-15 minutes. You will know when it is done when you have a smooth roundish ball that is not too sticky. If your dough is too sticky (probably will happen) add more flour as you knead. Wash out the bowl you were using to mix the ingredients with some warm water and dry it. Place the dough ball in the warm bowl with a little oil rubbed all over it and in the insides of the bowl and cover the bowl with a wet cloth. (I like to wet the cloth with some warm water but you can use whatever is coming out of your faucet.) Let this sit for 2 hours or till the dough pretty much doubles in size. If you are going to add raisins to your bread you will now need to soak the raisins. Please note that you can use as much or as few as you want. I tend to use about 3 oz. or a pretty large handful. Put the raisins in a small bowl and submerge them fully in water. You might as well just let these sit till the dough is ready. This keeps the raisins from drying out while the bread is baking in the oven. Take out the dough and punch it to get out the air bubble. 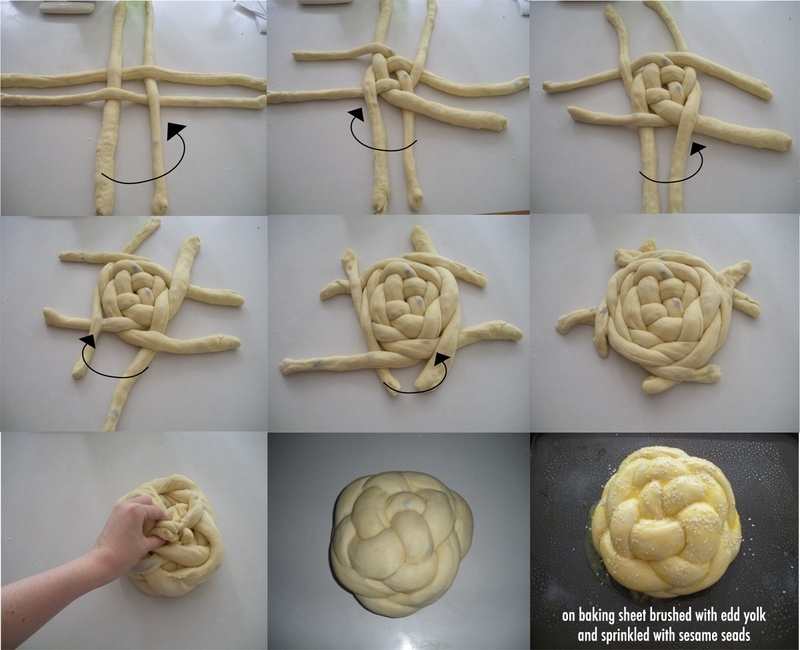 You can easily divide the dough into 6 parts and make 2 small regular braided loafs or divide the dough in 3 parts and make one big old braided challah. Or you can get all fancy and make a round crown braided loaf by following my step by step instructions. Divide the dough into 4 equal parts. If you are adding raisins you need to then drain the raisins. If you are not using raisins you can just skip to here. Arrange your 4 coils in a criss-crossed pattern like in the first photo. Moving counter clockwise take the under piece in each ‘set’ and place it over it’s partner directly to the right. Now moving in the opposite direction take the under piece again in each ‘set’ and place it over it’s partner directly to the left. Do this until there is nothing left to braid. You might have to pull the dough a bit but that is ok. When you run out of dough to braid pull all the ends up and pinch them all together. Flip the whole braided dough over carefully and surprise a beautiful seamless round braid! Spray a cooking sheet with non stick spray and place the loaf on the cookie sheet. 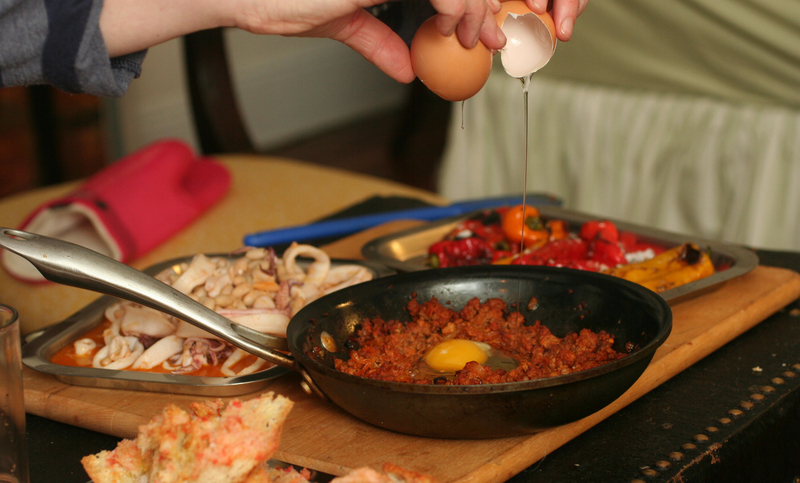 whisk up the egg yolk and brush it over all of the bread. If you want to add sesame seeds after the loaf gets brushed with egg yolk you can sprinkle them on top. While your oven preheats let your uncooked loaf of bread rise for about 30 more minutes. Bake in the middle of the oven for about 45 min to an hour. I really wanted a pizza with this topping. But I don’t have a pizza stone. I don’t have a big pizza dish. I didn’t want to bother with bread flour. I didn’t want to bother with much at all. So the first day I just used pre-made dough. Totally acceptable. Will use again. The second day, I felt compelled to try to make the dough myself. I decided on this America’s Test Kitchen recipe- because it didn’t require special ingredients and it uses a small round pan (i’m not so into rectangular pizza). I used a springform pan because that’s what I have. I’ve heard that if you don’t have a pizza stone, you can use unglazed terracotta tiles. As I didn’t have those either, per Test Kitchen, I used a rimless cookie sheet- upside down as a stone. 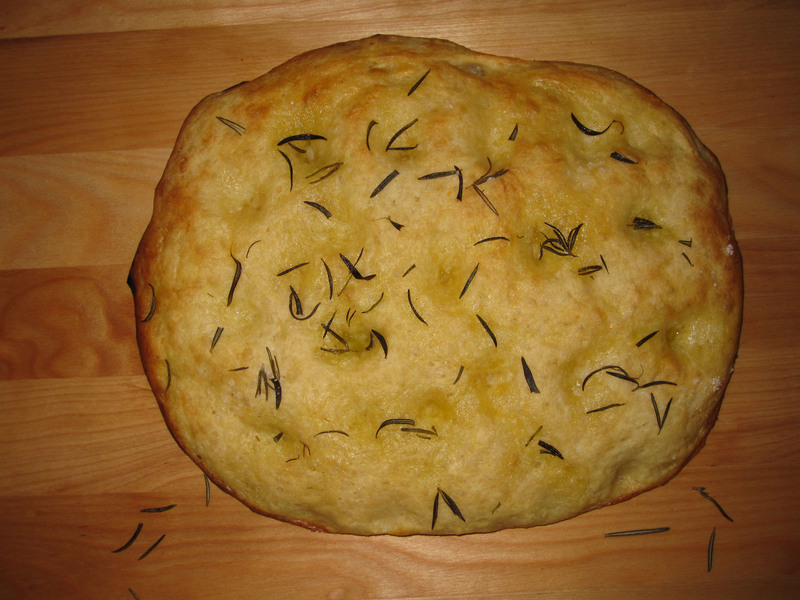 This recipe is a lot like focaccia bread– very thick and doughy. Enough dough for 2 pies. The second pie I made in an 8 inch square pan- as it turns out, square pizza still tastes good. If you have a slightly bigger pan, i’d probably recommend it- it would let the dough be a little less super thick. Can also use this amount of dough- don’t divide in half- in a 14-inch deep dish pan- though I’m not sure who owns one of those. 6 tablespoons olive oil- more to coat bowl w.
Bring 1 quart water and potato to a boil in small saucepan over medium-high heat; cook until potato is tender, 10-15 minutes. Drain potato and cool until can be handled. Press through potato ricer or large holes of a box grater. Measure 1 1/3 cups lightly packed potato; discard remaining potato. Adjust one oven rack to the highest position and the other rack to the lowest position. Heat oven to 200 degrees, maintain heat for 10 minutes then turn off heat. Combine flour, yeast, and salt in food processor. With motor running, add the water and process until the dough comes together in a shaggy ball. Add the potato and process for several seconds, then add 2 tablespoons of the oil and process several more seconds, until dough is smooth and slightly sticky. Transfer the dough to lightly oiled medium bowl, turn to coat with oil, and cover the bowl tightly with plastic wrap. Place in the warmed oven until the dough is soft and spongy and doubled in size, 30-35 minutes. Oil the bottom of two 10-inch cake pans with 2 tablespoons olive oil each. Turn the dough onto a clean, dry work surface and divide in half. Pat each into a 9-inch round. Transfer to the round to oiled pans, cover with plastic wrap, and let rest until the dough no longer resists shaping, about 10 minutes. Place a pizza stone or rimless baking sheet on the lowest rack and preheat to 500 degrees. Uncover the dough and pull it into the edges and up the sides of the pan to form 1-inch high lip. Cover with the plastic wrap and let rise in a warm, draft-free spot until doubled in size, about 30 minutes. Uncover the dough and prick generously with fork. Reduce oven temperature to 425 and bake on the heated stone or baking until the crust is dry and lightly browned, 5-10 minutes. Add desired topping, bake until cheese is melted, another 10-15 minutes. Move to top rack and bake another 5 minutes until cheese golden brown in some spots, about 5 minutes longer. To make sure crust is done, use spatula to life up the crust- i should be nicely browned on the bottom. Let cool 5 minutes. In the Add topping stage- add halved cherry tomatoes and mozzarella. Melt. After pizza is out of the oven, rinse arugula, toss with olive oil, salt and pepper. Fry egg and place on top, crack open runny yolk. 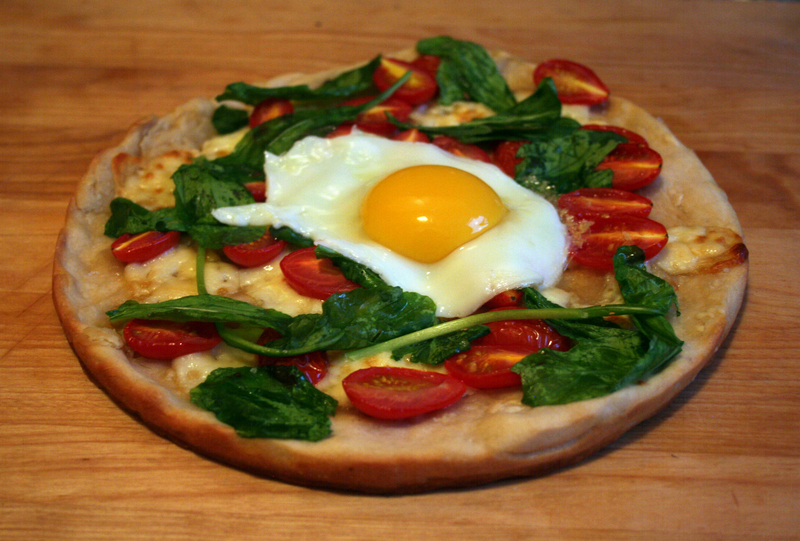 Or- haven’t tried it- but Rach said you can crack the egg directly on the pizza and place back in the oven to barely bake- place cold arugula on top. Drizzle with olive oil, mozzarella, ricotta, red chili flakes. Melt. Sprinkle with fresh ground sea salt and pepper. This was my first time tackling bread made with yeast. While it was initially intimidating- it was much easier than expected. Though it is time consuming- most of the time is just spent waiting for the dough to rise. I made mine with sea salt and rosemary topping- but feel free to be inventive. 1. For the dough: Bring 1 quart water to a boil in a small saucepan: add the potato and simmer until tender, about 25 minutes. Drain the potato well, cool, and grate through large holes of a box grater. Reserve 1-1/3 cups lightly packed potato. 2. Meanwhile, using a standing mixer of food processor, mix or process the yeast, 1/2 cup of the flour, and 1/2 cup of the warm water until combined. Cover tightly with plastic wrap (or put the work bowl lid on) and set aside until bubbly, about 20 minutes. Add the remaining dough ingredients, including the reserved potato. If using the mixer, attach the paddle and mix on low speed until the dough comes together. Switch to the dough hook and increase the speed to medium; continue kneading until the dough is smooth and elastic- about 5 minutes. For the food processor, process until the dough is smooth and elastic- about 40 seconds. 3. Transfer the dough to a lightly oiled bowl, turn to coat with oil and cover tightly with plastic wrap. Let rise in a warm, draft-free area until the dough is puffy and doubled in volume, about 1 hour. 4. With wet hand, press the dough flat into a generously oiled 15-1/2 by 10-1/2- inch rimmed baking sheet. If the dough resists going into the corners (and it probably will) cover it with a damp cloth and let it relax for 15min before trying to stretch again. Or, if making rounds, halve the dough and let it relax for 15 minutes before trying to stretch again. Or, if making rounds, halve the dough and flatten each piece into an 8-inch round on a large (at least 18 inches long– or can split onto two pans), generously oiled baking sheet. Either way, cover the dough with plastic wrap; let rise in a warm, draft-free until the dough is puffy and doubled in volume, 45 min to 1 hour. 5. Meanwhile, adjust an oven rack to the lower-middle position and heat the oven to 425 degrees. 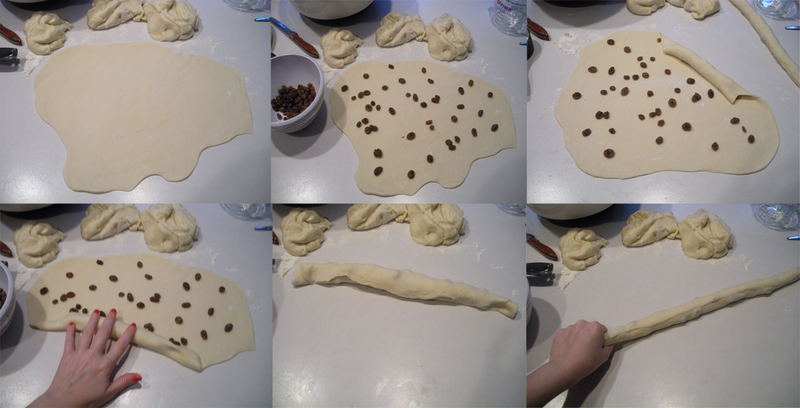 With wet two fingers, dimple the risen dough at regular intervals. The dimples (about 2 dozen- or one dozen in each 8 inch round). should be deep enough to hold small pieces of topping, herbs and pools of olive oil. 6. For the topping: Drizzle the dough with the oil and sprinkle evenly with rosemary and coarse salt, landing some in pools of oil. 7. Bake until the bottom crust is golden brown and crisp, 23-25 minutes. Transfer to a wire rack to cool slightly.